The next step in the Run An Empire journey is here and we’d love for you to be part of it. We’re getting ready to launch to everyone in the world, and to be able to do so we’re seeking investment via Crowdcube. In fact, we’ve already hit our funding target! You can invest from as little as £10 (as long as you’re eligible, see below for details) and in return you’ll own a small part of our company! 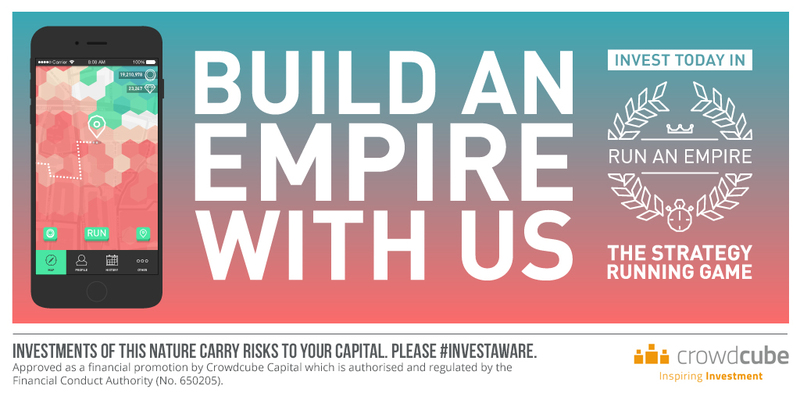 If you’d like to see Run An Empire reach for the big time then get behind us in any way you can – whether it’s through making an investment or just spreading the word about our campaign. You can check out our pitch on Crowdcube here. Run An Empire is a strategy running game for mobile that’s based in the real world. Players compete to own the most territory in their neighbourhood by physically running around it. Now Run An Empire for iPhone is almost ready for the public. A successful global launch requires a lot of time and energy – so we need to scale up by securing more funding. Crowdcube is a leading investment crowdfunding platform, where a community of like­minded people pool their money and knowledge together to back startup, early and growth stage businesses. Whereas our Kickstarter offered rewards, our Crowdcube campaign actually offers equity in the business, meaning we all share in the success of Run An Empire. Launching and running a global multiplayer game has significant challenges. We want to do justice to all the ambition we have to make Run An Empire the best located game ever made. This means we need marketing budget, a bigger team and to invest in the best infrastructure. The plan is to continue the beta program, but also launch a public version in a test market in February, where we can prove our user-acquisition and user-retention strategy with the general population. We’ll then phase in more countries to ensure our models fit and that the new market launches are as effective as they can be. The funding we raise via Crowdcube will cover these costs. Can anyone invest via Crowdcube? To invest on Crowdcube you need to be over 18 and legally entitled to invest. You need to live in a country where you may legally receive financial promotions of the nature provided by Crowdcube and are legally entitled to invest in the type of investments. There are some countries where investment laws prohibit and/or limit funding methods like Crowdcube for unaccredited investors – if you’re a resident of the United States, Canada or Japan, we’re unfortunately unable to advertise our investment pitch to you, and you can’t view or invest in our company on the Crowdcube site. Are there risks in investing with Crowdcube? If you’re interested in having a conversation with us about this, or if you want any other details about our pitch, do please feel free to get in touch with us via investors@runanempire.com. We’re really excited about what lies ahead and we really hope you’ll join us for the next stage. Investments of this nature carry risks to your capital. Please #InvestAware. Approved as a financial promotion by Crowdcube Capital which is authorised and regulated by the Financial Conduct Authority (no. 650205).